I am starting to become a real fan of the smartwatch phenomena. Each day I come across news and insights regarding the latest products on the market and I truly believe that wearables are here to stay. I want to explore more, to generate ideas, to sketch concepts that I can even wrap around my wrist. I wasn't happy with what I found on the Internet in terms of resources; indeed there are some useful stuff, but It wasn't enough. Without any further ado I made my very own templates to use and share with the world. 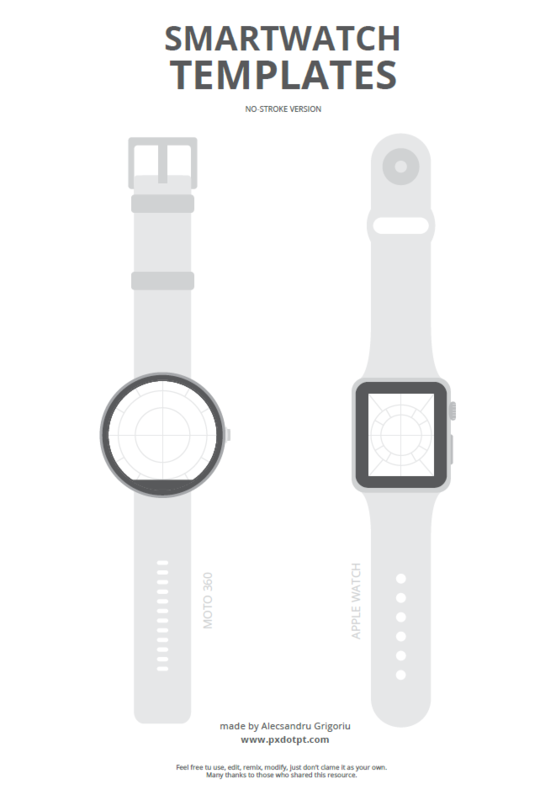 For now, only Moto360 and Apple Watch are highlighted; they are the heavy-weight champions of this category. All the templates are in .pdf format, vectorized so you can open them with your favorite tools. There are two versions for each template: stroke and no-stroke. If you want a more wireframe-ish look you can go with the version made using outlines. If you are more of a flat person, you can go with the no-stroke version. Besides the two versions, the files are structured so you can choose the one you need. 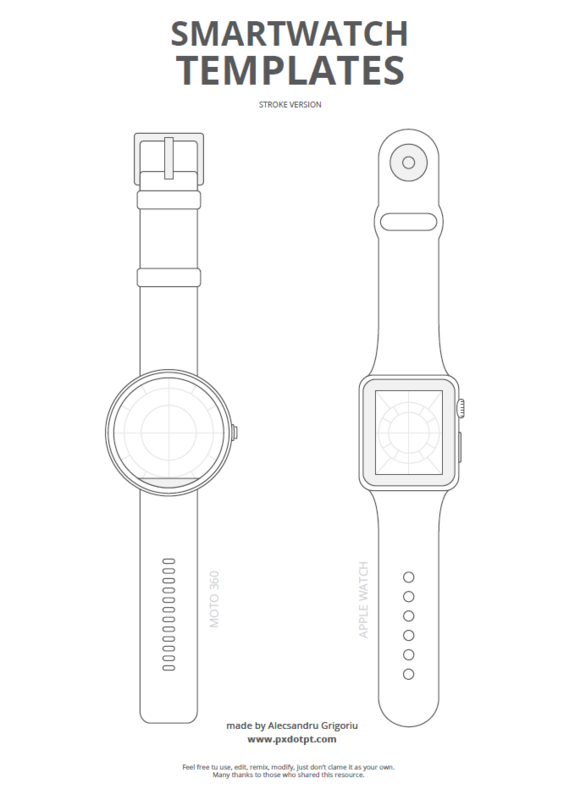 You have the template with the full view of the watches (including the strap) and then you have the templates with only the watch face available in order for you to draw and take side notes. All the templates have guides so you can draw more organized. I even added lines for hours if anyone wants to doodle watch faces or other skins. I used an A4 page and placed the 46 and 42 mm graphics to simulate their real sizes. In my opinion, the most useful thing about these resources is the fact that you can cut it and wrap it around your wrist (Here, I recommend you edit the strap to match your wrist size). This is the beauty of paper prototyping: it's easy, quick and affordable to test your concepts without nothing to lose. Testing out the paper prototype. 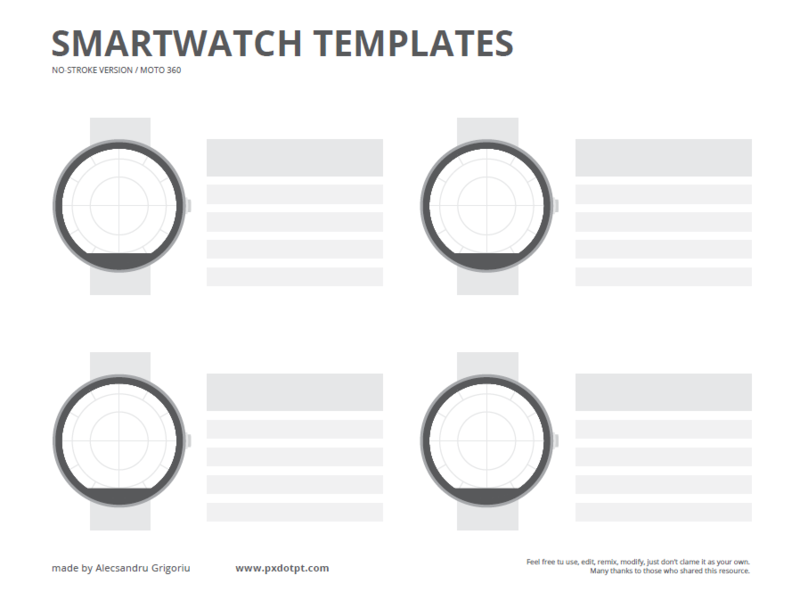 Download all the smartwatch templates. 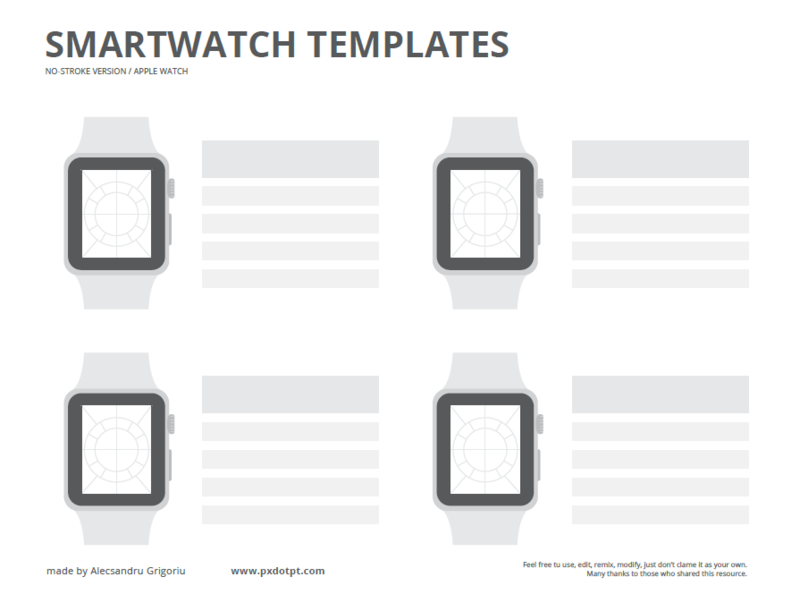 Download the smartwatch template with the strap. 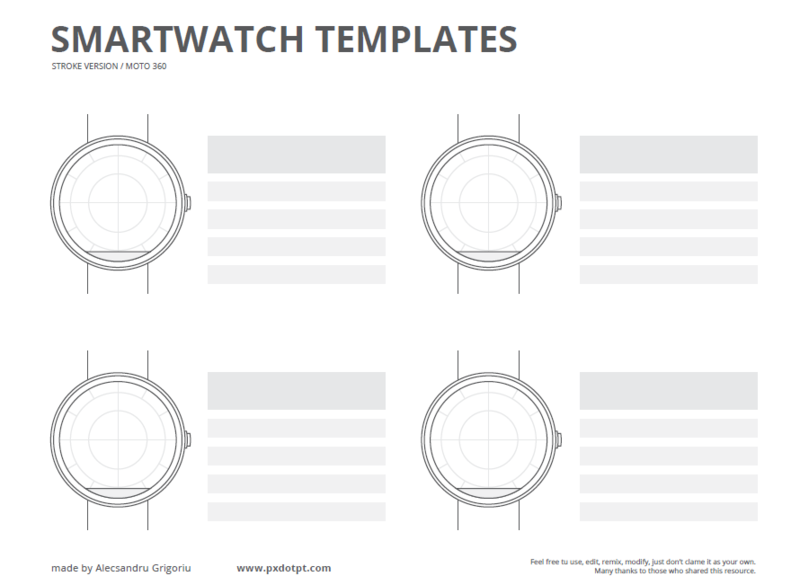 Download the Moto360 template (watch face only). 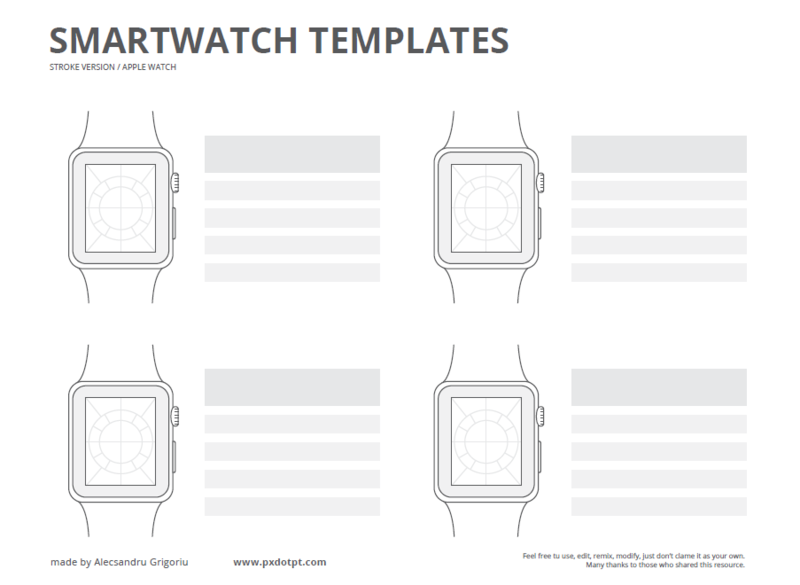 Download the Apple Watch template (watch face only). Feel free tu use, edit, remix, modify, just don’t claim the templates as your own (It's not nice). Many thanks to those who will share and already shared this resource. If you have any feedback, please do inform me. I want to make it better, so don't hesitate to buzz.